First Line: "Today was the day a thousand dreams would die and a single dream would be born"
Brilliant! The Kiss of Deception was just all sorts of awesomeness. I neglected a lot of responsibilities over this book and it was well worth it. The book starts off with Lia a royal princess the first daughter and soon to be married but she has other plans for her future and takes off to live that life with the help of one of the servants Pauline who also happens to be a close friend of hers. Lia settles into a life that she always wanted she knows there is a lot of very important people looking for her but figures who is going to think a girl working in a tavern wearing shabby clothes is a princess. You have no idea how much I loved this book. I've never been a fan of more then two povs and this book had it and guess what I loved it! We have Lia's pov, and then every once in a while we have the Prince and the Assassins pov only thing is we don't know who is the prince and who is the assassin there is a guy named Rafe and one named Kaden but you don't learn who is who until Lia does. The name truly fit the book in my opinion, Lia thought she created this safety net of a life for herself and had no idea that the two guys that were worming there way into her new world were deceiving her the entire time. Beware of a semi love triangle of sorts, well more like Lia loved one of the guys but both of them fell for her kind of thing all I know is it didn't bother me and I am hoping beyond hope it stays the way it is and she doesn't develop intense feelings for the other guy in the second book. As far as the main characters they were fantastically written. Lia, Kaden, and Rafe were all very complex characters with many layers to them. I'm not going to talk much about Kaden and Rafe because I don't want to give away who is who since that was half of the fun trying to guess who is the prince and who is the assassin. As for Lia this princess was not a damsel in distress whatsoever she was fierce and daring but at times a little hasty with her decisions truth be told all of that made her to be very real and likable. Even though I have tons of questions about Rafe and Kaden I am just as eager to learn about some of the secondary characters such as Lia's mom and her reasons behind a few of her decisions when it came to Lia and her ability. Then you have Pauline and Gwenyth with how things kind of ended with them I need to know what is going on which obviously we wont know till the next book which is killing me especially with that cliffhanger, yes this book has cliffhanger one that will have you throwing a fit because you don't have the second book in your hands like yesterday. Overall one of the best fantasy reads I've read all year. The book had it all romance, betrayal, adventure, heartbreak, politics, and suspense. 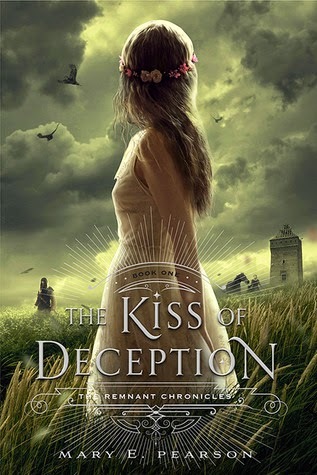 I highly recommend The Kiss of Deception. Memorable Quotes: ~ "She was trouble, that was clear, and the day she fled our wedding, I had dodged a poisonous arrow. She did me a favor. I could almost laugh at father's suggestion of taking a mistress after the wedding. This girl could make the whole royal court and half the king's army regret such a decision." ~"The devil had arrived. And some strange part of me was glad." ~"The truths of the world wish to be known, but they won't force themselves upon you the way lies will. They'll court you, whisper to you, play behind your eyelids, slip inside and warm your blood, dance along your spine and caress your neck until your flesh rises in bumps."